A sad incident telling a story with a strong message. 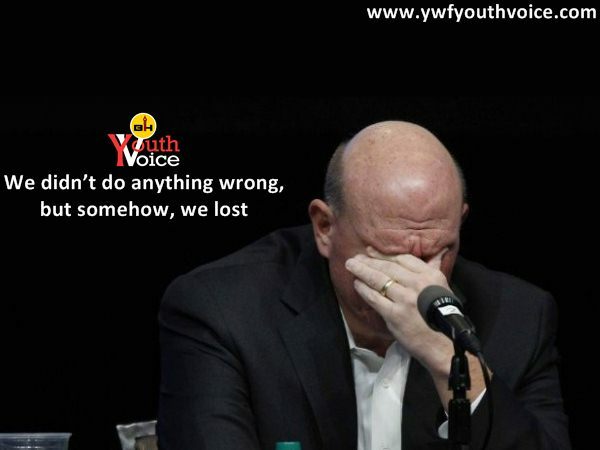 Few months back, during the press conference to announce Nokia’s smartphone division being acquired by Microsoft, Nokia CEO ended his speech saying this “we didn’t do anything wrong, but somehow, we lost”. Upon saying that, all his management team, himself included, teared sadly. Nokia has been a respectable company. They didn’t do anything wrong in their business, however, the world changed too fast. Their opponents were too powerful. They missed out on learning, they missed out on changing, and thus they lost the opportunity at hand to make it big. Not only did they miss the opportunity to earn big money, they lost their chance of survival. The message of this story is, if you don’t change, you shall be removed from the competition. It’s not wrong if you don’t want to learn new things. However, if your thoughts and mindset cannot catch up with time, you will be eliminated. The advantage you have yesterday, will be replaced by the trends of tomorrow. You don’t have to do anything wrong, as long as your competitors catch the wave and do it RIGHT, you can lose out and fail. To change and improve yourself is giving yourself a second chance. To be forced by others to change, is like being discarded. Those who refuse to learn and improve, will definitely one day become redundant and not relevant to the industry. They will learn the lesson in a hard and expensive way!